Gift Vouchers are perfect when you just cannot decide which item to purchase for that special person. 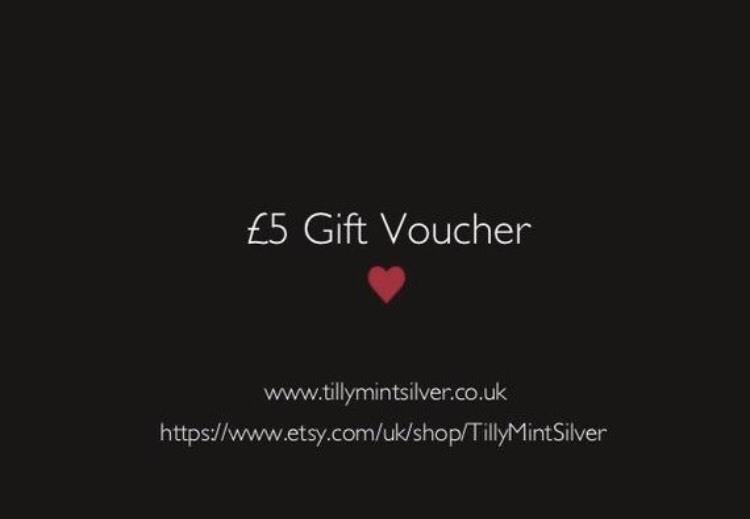 Tilly Mint Silver gift vouchers are available in affordable multiples of £5.00 and are available by contacting Tilly Mint Silver directly or they can be purchased from the Tilly Mint Silver's online Etsy shop. Vouchers can be sent direct to the recipient if requested at the time of purchase. Vouchers must be used whilst Tilly Mint Silver is listed as trading. Vouchers can only be used against items currently listed in the Tilly Mint Silver online Etsy shop. Un-used amounts on vouchers cannot be refunded or credited, however any shortfall in the purchase price can be paid in cash, cheque, BACS or paypal. The number on the voucher(s) must be given at the time of contact and expenditure. Once used the vouchers cannot be re-used, sold or re-issued.